Summary: Nickel alloys are a complex family of materials, but alloys that are used extensively in certain areas of the chemical process and other industries. This webinar will help engineers: (1) Understand the differences between both the performance of the different families and alloys within a family. (2) Look out for certain pitfalls when selecting nickel alloys for corrosion resistance (including some practical experiences). 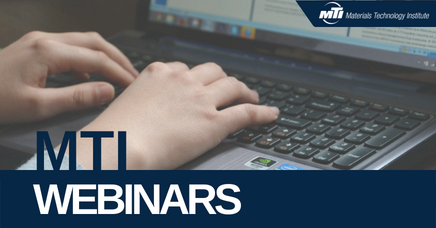 (3) Learn what MTI and other reference materials are of value in selecting nickel alloys. (4) Understand the basics which are important for further learning about proper welding and fabrication of each family. Login: You must register online to receive the webinar credentials.